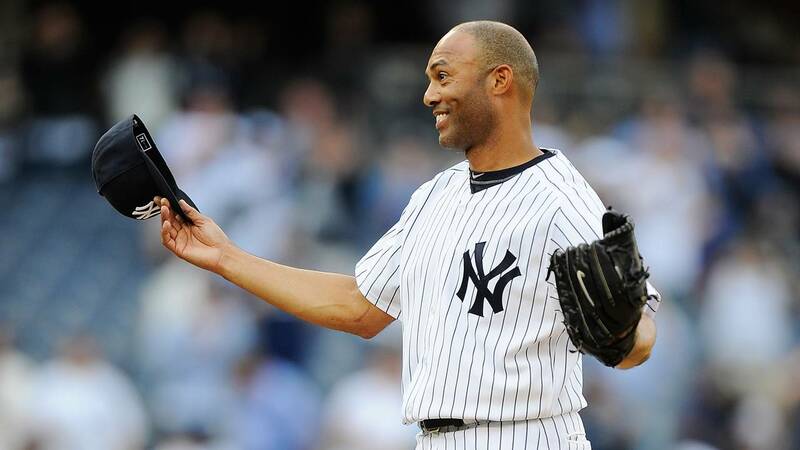 NEW YORK (AP) - New York Yankees great Mariano Rivera became the first unanimous Hall of Fame selection on Tuesday, elected to the Class of 2019 along with Roy Halladay, Edgar Martinez and Mike Mussina. The retired Yankees closer, who is baseball's career saves leader with 652, received all 425 votes in balloting by the Baseball Writers' Association of America. The four elected in the voting announced Tuesday will be joined by Today's Game Era Committee selections Harold Baines and Lee Smith in being inducted in Cooperstown on July 21. Rivera, who won five World Series over his 19 seasons with the Yankees, broke the record held by Ken Griffey Jr. for the top percentage of 99.32. Griffey was on 437 of 440 ballots when elected in 2017. Halladay, who died at 40 years old in a November 2017 plane crash, will be the first posthumous inductee since Deacon White in 2013 and Ron Santo in 2012. The former Toronto Blue Jays and Philadelphia Phillies ace received 85.4 percent of the vote. Martinez, who joins Baines and 2014 inductee Frank Thomas as the only Hall of Fame members to play most of their games at designated hitter, also received 85.4 percent of the vote. The former Seattle Mariners slugger, who hit .312 with 309 homer runs and 1,261 RBIs over 18 seasons in the majors, made it into the Hall on his 10th and final try on the writers' ballot. Lefty Mussina, who posted a 270-153 record with 2,813 strikeouts over 18 seasons playing for the Yankees and Orioles, received 76.7 percent on the ballots, just over the 75 percent needed for induction. Missing out yet again were Barry Bonds and Roger Clemens, who made gains in their seventh time on the ballot, but fell short at 59.1 percent and 59.5 percent, respectively. Curt Schilling finished just ahead of Bonds and Clemens, also failing to earn induction with 60.9 percent. Fred McGriff, in his 10th and final year on the writers' ballot, received just 39.8 percent.